Enjoy daily breakfast for two at participating resorts on Kauai, Oahu, Maui and the Big Island. Book now through December 20, 2019. Renew your spirit with an invigorating game of golf on greens designed by Robert Trent Jones, Jr. and refresh your body with a relaxing swim in one of the resort's shimmering pools. Delight in simple splendors like snorkeling and whale watching. Slip inside your villa to discover intuitively designed floor plans, spacious accommodations and rich décor suffused with the energizing spirit of Kaua‘i. Private lanais and a Heavenly® Bed will enrich your escape to this Hawaiian hideaway. Start Your Day Sunny Side Up Enjoy daily breakfast for two on us. No matter how you plan to spend your trip, start every day with a hearty meal to kick-start your morning. Enjoy breakfast for two, on us, for each day you stay. 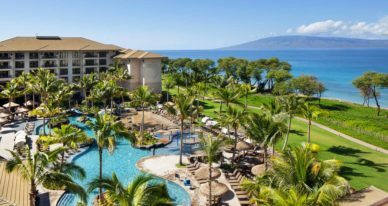 Situated on Maui’s legendary North Kā’anapali Beach, The Westin Nanea Ocean Villas, Ka’anapali invites guests to choose their own pace and level of adventure. Snorkel and scuba dive in the pristine Pacific just off the resort’s shore—the active coral reef is home to tropical fish and honu (Hawaiian green sea turtles). From December to March, humpback whales may breach the water’s surface. The resort’s world-class amenities include a cultural center, a WestinWORKOUT® Fitness Studio, an expansive lagoon-style pool, oceanfront cabanas, and children’s pool and beach areas. Be nourished by our full-service restaurant’s delicious meals made from fresh ingredients, and sip a refreshing drink at the beach bar. Cerulean water and the islands of Lana’i and Moloka’i in the distance provide a breathtaking backdrop for executive retreats and intimate gatherings. Our 16-acre oceanfront resort comprises 390 one-, two-, and three-bedroom villas that offer many of the key amenities of home. Private furnished lanais present breathtaking views of the ocean or the resort grounds. Each living area features a home entertainment system, a wardrobe armoire, and a queen-size sleeper sofa. A fully equipped kitchen boasts stainless-steel appliances, and washing and drying machines are nearby. Every bedroom includes a king-size Heavenly® Bed for a restorative night’s sleep. Refresh daily in the Heavenly® Bath with a large shower, a bathtub, and a vanity. Vacation residences offering a full complement of amenities and resort services, plus all the comforts of a luxury home. Enjoy stunning vistas and an exotic, idyllic setting on exclusive oceanfront property on Maui's North Beach. From magnificent ocean views to unprecedented amenities, this resort is in harmony with Hawaii's culture and environment. Maui's gentle climate and fabled surroundings form the framework for a relaxing yet invigorating experience. Recharge by engaging in water sports or nearby championship golf. Find rejuvenation in Maui's natural splendor. Spacious, richly-appointed one- and two-bedroom villas offer both island and ocean views, stone flooring, and other distinctive touches that truly reflect the unique Hawaiian culture and help you rejuvenate. 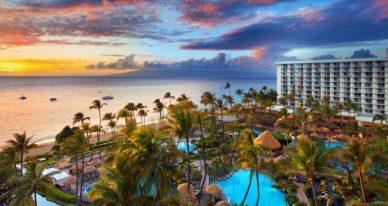 The Westin Maui Resort & Spa, Ka'anapali is located along a breathtaking stretch of the gorgeous, white-sand Ka'anapali Beach where you'll find windsurfers and humpback whales frolicking in the warm Pacific Ocean. Discover an astonishing range of activities. Whether you're into scuba diving or soothing skincare from our signature Heavenly Spa by Westin™, world-class golfing, or our 87,000-square-foot aquatic playground—we offer countless ways to recharge. Each guest room enjoys a private patio, or lanai, with refreshing views of lush gardens, waterfalls, tropical landscaping, or the ocean. You'll also find our signature Heavenly® Bed and Heavenly® Bath waiting to offer new levels of comfort. Discover our Keauhou Bay resort, where land and sea adventures immerse you in the culture of Keauhou, the birthplace of King Kamehameha III. Discover culture and adventure in the heart of Hawaii. 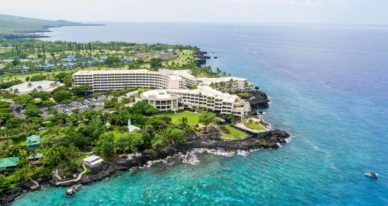 Nestled atop the lava rocks of the Kona Coast, our oceanside retreat is just minutes from Kona Coffee farms, a short drive from snorkeling in Kealakekua Bay and Honaunau Bay, and the closest resort to Volcanoes National Park. Embrace island life in our oceanfront pool, at Ho'ola Spa, or via watersports and traditional Hawaiian activities, such as snorkeling in the bay, cultural tours, and hula lessons. Sheraton Fitness adds to the recreation, while Rays on the Bay serves up locally sourced meals. Relax in our 508 welcoming guest rooms styled by Hawaiian designer Sig Zane. The light-filled rooms—most with a private lanai—highlight mountain or ocean views at the same time they present a Sheraton Signature Sleep Experience bed, soothing rainforest shower, and more. 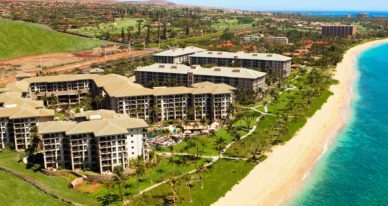 Situated on Kaanapali Beach, we're at the foot of the famous Black Rock—just minutes from the open-air dining, water activities, and famous beachfront shopping of Whaler's Village as well as the art galleries of Front Street in Old Lahaina Town. Adventurers, romantics, and meeting goers alike will enjoy swimming in our oceanside Lagoon Pool, working out at Sheraton Fitness, and savoring fresh catches at our four bars and restaurants. Then fit in a sublime escape at The Spa at Black Rock. Our 508 guest rooms all feature fresh-air lanais and relaxing views—some boasting panoramic ocean vistas. Stay in touch with the LCD TV and High Speed Internet Access. The Sheraton Signature Sleep Experience and modern bathrooms guarantee renewal. In the center of Waikiki—the heartbeat of excitement and entertainment—our resort is perfectly located for fun-loving family vacations. 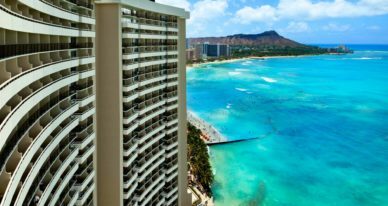 Just three miles from the famed Diamond Head crater, we're mere steps from Waikiki Beach, shopping, and more. Relax at our two outdoor pools, Sheraton Fitness, and Spa Khakara, and share great times at our three unique restaurants. 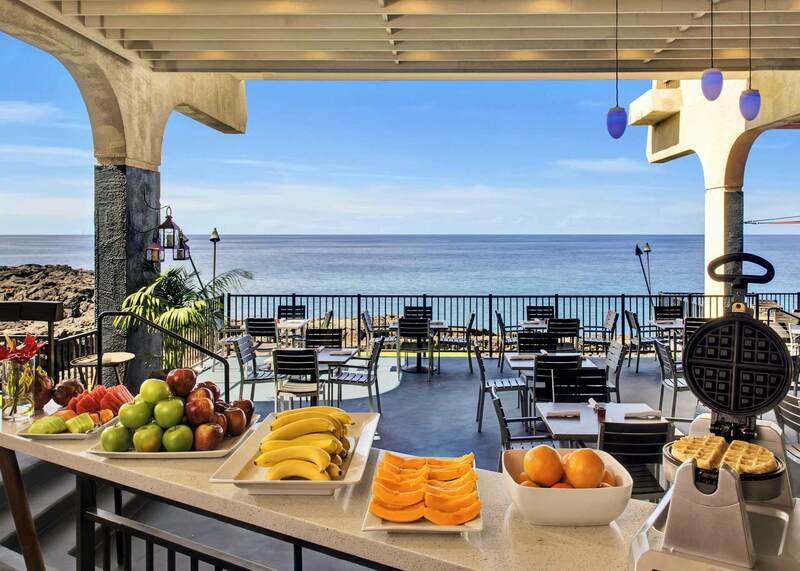 Connect at the stylish and comfortable Leahi Club Lounge, or in 15 meeting rooms—including one of Hawaii's largest ballrooms. Enjoy modern Hawaiian style found in 1,636 guest rooms—with ocean views from many of our rooms and all 136 suites. Relax in the comfort of island accommodations boasting the pure white Sheraton Signature Sleep Experience, an LCD TV, and a fresh-air lanai. The "First Lady of Waikiki" welcomes guests with the grace of a bygone age and the comforts of a modern, world-class landmark. 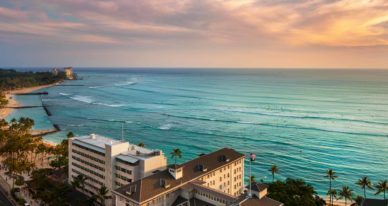 Known as "the first lady of Waikiki," the oceanfront Moana Surfrider, A Westin Resort & Spa, Waikiki Beach combines turn-of the-century Victorian elegance with modern amenities. 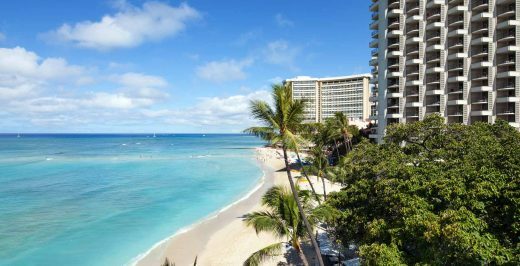 Located in the heart of Waikiki, we are a short walk from shopping, dining, and attractions. Retreat to the shade of our historic banyan tree, splash around the pool and ocean, or recharge at our WestinWORKOUT® Fitness Studio. Soothe body and mind at our Moana Lani Spa, a serene sanctuary set amidst a true tropical paradise on Waikiki Beach. Enjoy Hawaii as smart and sophisticated travelers have since 1901. Recent renovations have revitalized all 793 guest rooms and suites, many of which offer spectacular ocean views as well as the signature Heavenly® Bed and Heavenly® Bath. An oceanfront location on Poipu Beach with an array of exhilarating water sports and a setting that invites you to indulge in luxury. Savor a warm Hawaiian welcome and explore the island of Kauai. Our resort is located on Kauai’s sunny South Shore alongside Poipu Beach. Guests will especially enjoy our new poolside restaurant, Lava’s, and our new oceanfront pool and bungalows. Enjoy a host of outdoor activities, from water sports to tennis to nearby championship golf. And, of course, you can always just relax and soak up the sun. Our deluxe, low-rise Hawaiian haven provides a choice of mesmerizing oceanfront or colorful, tropical garden views that are enjoyable day and night. After you wind down and refresh following a glorious day outdoors, bring everyone together for dinner and choose from a delicious selection of international cuisine. 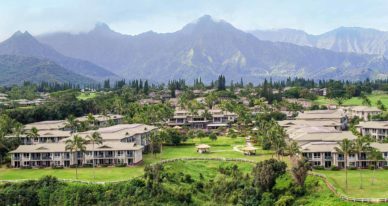 With golden-sand beaches and misty sea breezes just footsteps away, you’ll feel right at home at the Sheraton Kauai Resort. Fascinating cultural offerings, extravagant shopping, delectable dining, and lively nightlife – all just steps from Waikiki Beach. Located in the heart of Waikiki, one of the world’s most famous playgrounds, The Sheraton Princess Ka’iulani offers comfort and relaxation while providing visitors an exceptional vacation value. 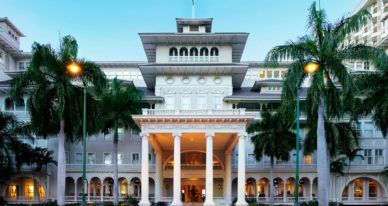 The hotel graces the former estate of Hawaii’s last and most beloved princess—Victoria Ka’iulani—and is just steps from world-famous Waikiki Beach, unlimited shopping, dining and nightlife. Our guests enjoy romantic poolside dinners, nightly entertainment and the extraordinary dinner show: Creation – A Polynesian Journey. Sheraton Princess Ka’iulani embraces warm Hawaiian hospitality as it was intended, and delivers the spirit of Aloha to all of our guests. Dive into the glistening waters of our freshwater swimming pool or spend the day relaxing in lounge chairs under swaying palms. As the sun melts into the ocean, hold hands with someone you love and head to Waikiki Beach for an evening stroll. Listen to island melodies, and watch a performance by Hawaii’s premier entertainers at the Pikake Terrace open-air buffet. Find all the comforts of home in our 1,140 guest rooms and suites, with inspiring views of the Pacific, Koolau Mountains, and sparkling lights of Honolulu. 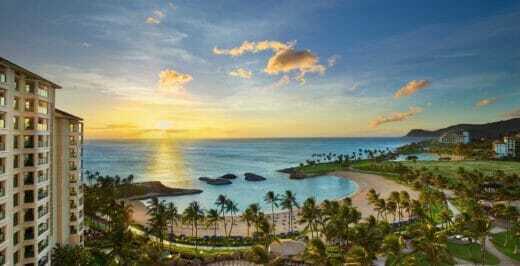 Enjoy the charm of Oahu and spend time with family and friends at Sheraton Princess Kaiulani. 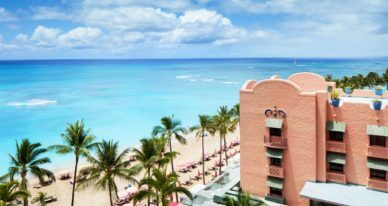 Once a playground for international royalty, Hollywood elite, and heads of state, this legendary pink-hued retreat is ushering in a new era of Hawaiian-style luxury on Oahu’s golden Waikiki Beach with striking décor and unmatched service. Breathe in the salty air along an endless stretch of sand, or take sanctuary in a private beachfront cabana. The innovative Abhasa Spa soothes the soul, while Azure, the island's seafood mecca, delights the senses with fresh and innovative fare. 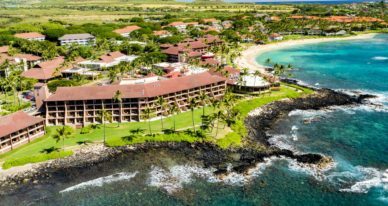 Classic Hawaiian design pays homage to a majestic heritage, while contemporary appointments lend a subtle sleekness to 529 expertly furbished guestrooms and suites, each one aglow with the rays of the island sun streaming through open windows. Play golf on our Arnold Palmer-designed course, frolic along our namesake white-sand beach, and be pampered with an indulgent spa treatment. 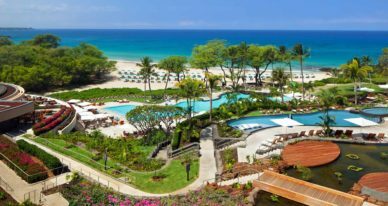 Nestled in natural bluffs above the Pacific, Hapuna Beach Resort stretches along its namesake white-sand beach on Hawaii’s Big Island. 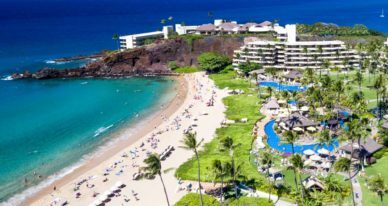 The Kohala Coast is known for its world-class shoreline, as well as for cultural and archaeological gems nestled between centuries-old lava fields. Turtle Point, an easily accessible snorkeling area, is home to colorful reef fish and, often, sea turtles. Kona (KOA) and Hilo (ITO) International Airports are 27 and 71 miles away, respectively. The resort’s contemporary style contrasts with lush, manicured gardens and the endless blues of the sky and the ocean. Our award-winning 18-hole Hapuna Golf Course was designed by Arnold Palmer, and next door’s beautiful Mauna Kea Golf Course was created in 1964 by Robert Trent Jones Sr. Both the 6,800-square-foot freeform swimming pool and a whirlpool overlook Hapuna Bay. The expansive spa ensures rejuvenation with a range of pampering options, including treatments for brides and couples. Nourishing local cuisine is served in serene dining venues. The resort boasts more than 85,000 square feet of upscale function space for productive business meetings and inspiring social events. Choose from 350 oversized guest rooms, including 36 suites, all of which afford ocean and sunset views from private furnished lanais. A double-door system allows breezes to flow through each well-appointed space that is equipped with a flat screen TV, data ports, and numerous outlets. Get a good night’s sleep in a signature bed, and refresh in a five-fixture bathroom. Every Oceanfront Suite is distinguished by its living room, wet bar, master bedroom, and 1.5 bathrooms. Receive nightly resort credit on your next Hawaiian vacation. Choose from participating resorts on Kauai, Oahu, Maui and the Big Island. Valid seven days a week through 12/20/19. Package includes breakfast for two adults and children up to twelve years of age staying in the same room at participating hotels. Breakfast offerings vary by hotel. Package availability varies by participating hotel and resorts. Valid Thursday – Sunday at hotels with a Friday or Saturday stay over required and seven days a week at Resorts. Limited number of rooms are available for this promotion. Tax is additional. Offer does not apply to groups of 10 or more rooms. Offer cannot be combined with any other promotions. Blackout dates may apply. Advance reservations required. Other restrictions apply. Rates are per room, per night and based on availability at the time of reservations.